Vietnam is situated in Southeast Asia and neighbors Laos, Cambodia and China. The majority of its population lives in rural areas and works in agriculture. With a high population density, land is scarce. About one-third of the land is used for agriculture. All land in Vietnam belongs to the population as a whole. The state administers the land on its behalf, and citizens and organizations rely upon land-use rights but do not own land. Vietnam’s laws emphasize gender equality regarding access to property and land rights. In practice, however, women have been left behind. 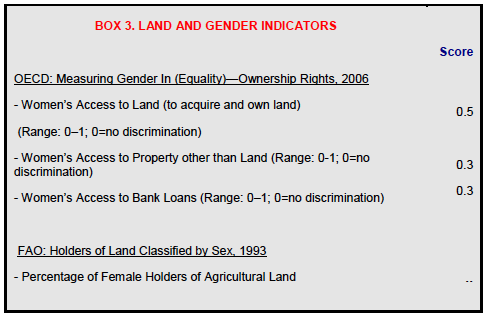 As compared to men, women are allocated smaller plots and less land overall; and women’s names are often not included on land-use right certificates. Such certificates, which are mandated by law, are necessary for formal state recognition of use rights, secure tenure, formal land transactions, access to formal credit and legal protection of land-use rights. Compulsory acquisition of land by the state is a source of social conflict in Vietnam. In October 2012 the National Assembly began considering a new land law that is expected to address this and other issues. Vietnam has a relative abundance of water, forest and mineral resources. However, the country faces several threats to its resources, including increasing water pollution, continuing degradation of primary natural resources and growing negative environmental impacts from increased mineral exploitation. While women’s rights to acquire, use, inherit and transfer land are protected by law, in practice they are insecure and not fully realized. Donors could advance women’s land rights by supporting initiatives to include women’s names on land-use right certificates; by piloting legal education programs targeted at women, local communities and entities charged with adjudicating and implementing women’s property rights (including mediation groups, mediation committees, People’s Committees and courts); and by piloting legal aid services that help women navigate complicated procedures that prevent them from obtaining and using their land rights. Although Vietnamese law now permits communities to hold formal land-use rights, institutional recognition of communal tenure has not occurred in practice. In districts where land-use right certificates have not been issued, groups following communal tenure practices are especially vulnerable to encroachment by others, including migrating populations and companies seeking to exploit various natural resources. This problem is particularly pressing for ethnic minorities in the central highlands area. Donors could increase tenure security for these communities and reduce the risk of conflict associated with their current insecurity by supporting efforts to issue land-use right certificates. By law, compensation for expropriated land (which in most cases is land used by farm households) must correspond to market price. In practice, however, Vietnam lacks specific procedures for assessing market value. Inadequate compensation is a source of widespread grievance that sometimes leads to violence. At least one city has managed to reduce the level of complaints associated with compulsory acquisition and pay compensation closer to market values by hiring independent land appraisers. Donors could help the government improve its ability to assess land value and pay proper compensation by supporting initiatives to train and deploy independent land appraisers. Lack of transparency is a key obstacle to the emergence of a more functional land market in Vietnam. Donors could help increase transparency by supporting initiatives that ensure land users’ access to relevant information about land. Such initiatives could include efforts to enforce laws that require the disclosure of all approved land-use plans, and development of a national land registration system that is integrated, publicly accessible, derived from provincial agency land records, based on individual land parcels and inclusive of all obligations and rights attached to each piece of land. Although Vietnam has a relative abundance of freshwater resources, access to water is uneven across regions and seasons. A lack of adequate sanitation facilities, along with increased urbanization, industrialization and mining activities has led to increased water pollution. In addition, a dearth of data and the devolution of authority to provincial agencies have led to less efficient, less effective water management. Donors could help reduce water pollution by facilitating investment in sanitation facilities in both urban and rural settings. Donors could also offer technical assistance to help the government obtain better data on water resources and improve coordination of water management across agencies. Despite the success of Vietnam’s reforestation efforts, forests have suffered continued degradation, and many residents, especially ethnic minorities, lack access to forestland use-rights. Donors could support the expansion of community-based allocation and management programs for forestland that the government has already begun on a small scale. Such programs would secure use rights for forest dwellers while promoting sustainable forestry practices. Seventy percent of Vietnam’s population lives in rural areas, primarily working in agriculture. Vietnam has one of the world’s lowest per capita land endowments, and most suitable lands are being utilized. About one-third of Vietnam’s land area is used for agriculture. Because land in Vietnam belongs to the population as a whole, and is administered by the state on the public’s behalf, citizens and organizations rely upon land-use rights, but do not own land. Beginning in the late 1980s, Vietnam implemented reform processes that included the allocation of land-use rights to farmers. By 2009, the state had allocated to land users 72% of Vietnam’s total land area and almost all of its agricultural land. By 2010, it had issued land-right certificates covering roughly half of Vietnam’s land parcels and more than 90% of farm households. Tenure rights in Vietnam are essentially usufruct rights, meaning that right holders may use land, but cannot own it. Use rights include the right to a state-issued land-use right certificate (LURC), which entitles holders to sell, rent, exchange, mortgage and bequeath their use rights, and to exclude others from the land. The state may grant use rights, and users may also legally acquire use rights through lease, inheritance or grant from a family member and purchase. LURCs are necessary for formal state recognition of a user’s rights and for secured tenure, formal land transactions, access to formal credit and legal protection of land-use rights. While Vietnam’s laws emphasize gender equality regarding access to and use of property and land, in practice women hold fewer rights to land. As compared to men, women are allocated smaller plots and receive less land overall, and although the law requires that LURCs list the names of both spouses for jointly held property, women are not equally represented on LURCs. A hierarchy of authorities at the central, provincial, district and communal levels administers Vietnam’s land policies. The Ministry of Natural Resources and Environment is the primary central-level administrative body for land, water and mineral resources, and People’s Committees at all levels (provincial, city, district, commune, ward and township) implement land policy, which the government determines at the central level. Vietnam has active markets for the sale and rental of land-use rights, though the level of trade in land rights varies from province to province. A number of possible factors inhibit development of a vibrant market in land-use rights, including lack of transparency, limits on lease periods, the costs and delays associated with transfer procedures and the government’s intervention in the allocation, transfer, use and valuation of land. The law allows the state to acquire land used by citizens for a wide range of purposes, including national defense and security, national interest, public interest and economic development. Although the law requires the state to pay compensation based on the market price of the land, the state lacks procedures for assessing market price and routinely fails in practice to assess market value. The law governing compulsory acquisition also requires the state to provide notice to land users, provide for their resettlement and support and hear challenges to acquisition decisions. In the most common form of compulsory acquisition cases, the state acquires land from farming households to develop industrial zones and clusters. Observers report that current procedures are slow, unpredictable and lacking in transparency. Approximately 70% of all complaints directed at the government each year are administrative complaints regarding land, and 70% of land complaints relate to compensation. Land-related conflicts in Vietnam stem from numerous causes. The state’s introduction of private use-rights conflicts with the land-use practices of some ethnic communities, which tend to use traditional communal management systems. Conflict also surrounds competing demands of various groups for agricultural land and forestland. Such conflict has been particularly high in the central highlands area. Vietnam’s compulsory acquisition procedures have also led to conflict. Complaints of inadequate compensation are widespread, and numerous protests have turned violent and led to police deployment. As with land, the government manages all water, forest and mineral resources for the population as a whole. The Law on Water Resources, Law on Forest Protection and Development and the Mineral Law govern the licensing and allocation of these resources. Despite a relative abundance of resources, Vietnam struggles to overcome several resource-related challenges, including water pollution resulting from an increase in industrialization and urbanization accompanied by a lack of adequate sanitation facilities; a reforestation effort hampered by continued degradation of primary natural forests; and environmental effects stemming from increased mineral exploitation. Vietnam is situated in Southeast Asia amid the Gulf of Thailand, the South China Sea and the Gulf of Tonkin. It borders China, Laos and Cambodia. The country contains 31,007,000 hectares, and the 2011 population was 87.8 million. The population is growing at an annual rate of 1%. Seventy percent of the population lives in rural areas, working primarily in agriculture. 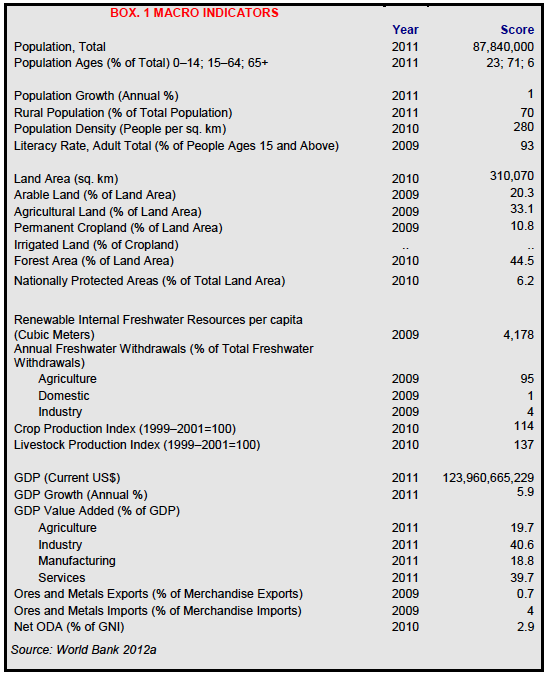 Vietnam’s 2011 GDP was US $124 billion, with 20% attributed to agriculture, 40% to industry and 40% to services. Vietnam is the world’s second-largest exporter of rice (its top export commodity), exporting over 7 million metric tons in 2011. Other top exports include crude oil, clothes and shoes, marine products, wood products, electronics, coffee, cassava, rubber, fresh fruit, cashews and tea (World Bank 2012a; World Bank 2010b; BBC 2011; VFA 2012; FAO 2009; CIA 2012). About one-third of Vietnam’s land area is used for agriculture, with 20% of its land considered arable, 11% used as permanent cropland and about 2% used as permanent meadow and pastureland. Vietnam’s top agricultural products are paddy rice, coffee, rubber, tea, pepper, soy beans, cashews, sugar cane, peanuts, bananas, poultry, fish and seafood. About 45% of Vietnam’s agricultural land (or 15% of its total land area) is irrigated. Seven to ten million hectares of Vietnam’s total area are wetlands, at least half of which are located in the Red and Mekong River Deltas (World Bank 2012a; FAO 2009; CIA 2012; Nang 2003). Vietnam has diverse natural forests, including evergreen and semi-evergreen broad-leaved forests, semi-deciduous and dry deciduous forests, mixed evergreen coniferous forests and mangroves. Forests cover about 45% of Vietnam’s land area. The country has undertaken a vast reforestation effort over the last 20 years, averaging an annual afforestation rate of 1% between 2005 and 2010 (World Bank 2010a; World Bank 2012a; FAO 2010). Evidence has emerged of land degradation caused by unsuitable agricultural and land management practices. In the northern mountains, arrested crop succession and forest clearing, especially when linked to a shift toward drier regeneration, are leading to soil erosion and loss of biodiversity in favor of imperata grasslands. In intensively irrigated rice plantations in lowland areas, waterlogging and nutrient imbalances are preventing land productivity gains (World Bank 2010b). Vietnam has one of the world’s lowest per capita land endowments, with less than 0.3 hectares of agricultural land available per person. Most suitable lands are being utilized. Intensity of land use is high, especially in areas of human settlement and wetland rice agriculture, and is increasing within other categories of use as well. The average number of paddy crops has increased to nearly two per plot-year (World Bank 2010b). The current distribution of land in Vietnam stems from a series of reforms that extend as far back as 1954. From the mid-1950s to 1975, the nation was divided into two countries: the Democratic Republic of Vietnam in the north, and the Republic of Vietnam in the south. Each country had a different agrarian structure. Communist reforms in the 1950s imposed agricultural collectivization in the north, while the south carried out a land-to-the-tiller program in the 1970s. The latter process provided ownership rights to former tenant farmers and led to approximately three-quarters of tenant households receiving rights to roughly 44% of the farm area in the south. This allocation to smallholders resulted in a 30% increase in rice production. The land-to-the-tiller reforms were largely lost when the Communists took power in 1975, but laid the foundation for the practice of household farming that spread across the country following decollectivization in the 1980s (Prosterman and Brown 2009). In the late 1970s, almost 97% of rural households in the north belonged to collectivized farms. Although Communist leadership attempted to collectivize the south, peasant households resisted, and only 24.5% joined cooperatives. Collectivized areas in the north and the south experienced low and declining agricultural growth and food grain availability (Kirk and Tran 2009). The government eventually suspended its failing attempt to collectivize the south, and implemented a series of measures in the late 1980s to transition Vietnam to a market-oriented economy. These steps, known as the Doi Moi reform process, included the allocation of land-use rights to farmers. By 2009, the state had allocated 72% of Vietnam’s total land area and almost all of its agricultural land to land users, with cropland allocation among farm households being relatively equitable as compared with many other developing and transitional countries. Farm sizes vary, but are typically around 0.2 hectares per capita (Kirk and Tran 2009; World Bank 2010b; Marsh and MacAulay 2006). Farms in the Mekong Delta region occupy 1.2 hectares on average, which is considerably larger than farm sizes in the Red River Delta area (Marsh and MacAulay 2006). Land allocation processes vary by district. Generally, equity between households is a key consideration, and the process takes into account the number of people in a household and the quality of the land. Typically, the total amount of land allocated varies among households and each household’s land is split into plots of varying quality. There are now approximately 70 million parcels of land in Vietnam (Marsh and MacAulay 2006). Vietnam has more than 50 distinct ethnic groups, including the Kinh (Viet) majority group (85.6%). Kinh families are more likely than other families to have high-quality irrigated land. In the central highlands, where coffee and other cash crops are a source of rural development, Kinh are much more likely to have perennial cropland, which has been important in enabling rural households to diversify income sources (World Bank 2008). Minority groups account for about 15% of the population and include the Tay (1.9%), Muong (1.5%), Khmer (1.5%), Mong (1.2%), Nung (1.1%) and others (7.2%). These groups tend to have higher poverty rates, in part due to the lower quality of their land, and are concentrated in the upland and mountainous areas of the central and northern highlands. The Khmer are based primarily in Vietnam’s lowlands, and the Tay, Muong and Nung tend to be valley-dwelling rice farmers in the northern mountains. Ethnic minorities often reside near forestland but do not have consistent access to forests. In the northwest region, half of all ethnic minority households report using forestland. In the central highlands, which hold the country’s largest forest area, only 4% of ethnic minorities report that they have forest use access (CIA 2012; Ravallion and van de Walle 2008; Dang 2009; World Bank 2008). Minority groups rely heavily upon land for their livelihood. Their production and land-use practices differ from the ethnic majority’s practices, focusing more on shifting cultivation, forestry and communal tenure arrangements. More than 90% of ethnic minority households dependent upon agriculture have land that they use for annual crops. Those who do have annual cropland tend to have more of it than the Kinh and Chinese (majority population), though this does not necessarily represent an advantage, as much of this land is on sloping terrain and yields only one crop per year. Whereas upland agriculture is an essential part of most ethnic minority livelihoods, the state has not focused agricultural research or extension efforts on understanding and improving upland agriculture. For example, research has not sufficiently addressed diminishing fallow times, which present a challenge for upland farming systems. Instead, the state has emphasized policies that have little impact on ethnic minorities, such as those that encourage the production of wet rice in valleys (Ravallion and van de Walle 2008; World Bank 2008). In 2003, Vietnam reported that 10.4 million farm households (90% of households using agricultural land) had received land-use right certificates (LURC). By 2010, the state had issued approximately 31.3 million LURCs, covering roughly half of Vietnam’s land area. Certification rates differed between land categories and were lower for non-agricultural land other than residential land and forestland (Hartl 2003; World Bank 2010b). The formal law governing land rights includes the 1992 Constitution of the Socialist Republic of Vietnam (amended in 2001), the 1986 Marriage and Family Law (revised in 2000), the 1995 Civil Code (amended in 2005), the 1993 Land Law (amended in 1998 and 2001) and the 2003 Law on Land. The Constitution vests all land – including forests, rivers and lakes, water sources and underground natural resources – in the population as a whole. It also provides that the state is to systematically manage all land and allocate it to organizations and individuals, and that those to whom land has been allocated are entitled to transfer their right of use to others. The 1986 Marriage and Family Law (revised in 2000) and the 1995 Civil Code (amended in 2005), govern matters relating to family, marital property rights and inheritance (FAO 2012a). The 1993 Land Law is credited with laying the foundation for a formal land market by providing increased land-tenure security, facilitating access to credit, and bolstering the transferability of use rights. It formalized the farm household as the main unit of agricultural production, and provided for the allocation of land-use rights to households, vesting in them the power to purchase and use inputs, sell outputs from the land and (to some degree) to make decisions regarding the use of land. The law also provides that land users may exchange, transfer, bequeath, lease and mortgage their rights, and requires the state to issue land-use right certificates (LURC) at the household level. Additionally, it increased tenure security by providing for use-right grants of 20 years for annual cropland (further increased to 30 years in a 1998 revision) and 50 years for perennial cropland. The law also imposed ceilings of 2 to 3 hectares on annual cropland and 10 hectares on perennial cropland, and addressed leasing of land to foreigners. Decree 64 of 1993 further delineated the local application of ceilings in various provinces (Marsh and MacAulay 2006; Haque and Montesi 1996). Revisions in 1998 added the rights to sublease LURCs and to use them as capital in joint venture arrangements (Marsh and MacAulay 2006). The 2003 Law on Land supported Vietnam’s transition to a market-oriented economy. It dealt with many aspects of land-use planning and land administration systems, decentralized many land administration responsibilities to local government structures and established policies and procedures to govern compulsory acquisition of land by the state. It also required that LURCs include names of both the husband and the wife if the land belongs to both, and required right holders to obtain an LURC to exchange, transfer, bequest, lease and mortgage land rights (Hatcher et al. 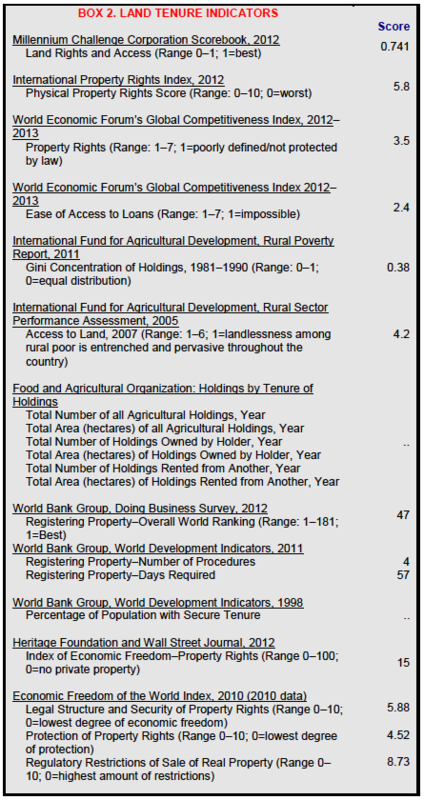 2005; World Bank 2010b; GOV Law on Land 2003). Although the 1993 Land Law stipulated that the state should issue long-term use rights to various non-state entities, the law did not mention customary groups such as village communities, hamlets or groups of households, and as a consequence such groups were not eligible to receive land use rights. The 2003 Law on Land sought to remedy this defect, and authorized the state to issue use rights to such customary groups (EASRD 2004). Vietnam’s legal system has not recognized customary laws since 1975. However, in areas where the state does not have the capacity to administer state law, customary rules are often an important source of regulation for social relations, ownership rights, property disputes and issues of marriage, inheritance, contract and tort. In minority and ethnic communities, customary rules are often the first choice for dispute settlements (Phan 2011). In October 2012, Vietnam’s National Assembly began considering a law to amend the 2003 Law on Land. The full scope of the new law is unclear, but government officials have indicated that it will address compulsory acquisition mechanisms and processes for determining the market price of land. It is also expected to address the expiration of 20-year land-use rights that the government granted to land users in 1993 (VCCI 2012; GOV 2012c; Hiebert 2012). As noted above, individuals, households and organizations cannot own land, as it belongs to the people as a whole. However, following the 1993 Land Law, the state may either allocate land-use rights, or lease land to individuals, households and organizations, who thereby acquire usufruct rights. This right includes the right to receive a land-use right certificate (LURC), to lease out, exchange, mortgage and bequeath the use right, and to exclude others from the land. This right also allows for land transactions that, while they are the equivalent of sales, are referred to as transfers, or chuyen nuong dat (Ngo 2005; GOV Law on Land 2003; EASRD 2004). Use rights, which may extend for 20 or 50 years depending on their type (annual cropland, perennial cropland or forestland) do not include the right to determine how land is used, which the state reserves the right to decide. Transfers of use rights require the transferor to possess a registered LURC and must be for a period within the term initially granted to the transferor (GOV Law on Land 2003; EASRD 2004). Several categories of legal entities may acquire land-use rights. The state can grant use rights either through allocation or lease, and some rights may require the user to pay fees or rent. By law, categories of “land users” include: (1) domestic organizations (e.g., political organizations and units of the People’s Armed Forces), which are allocated land by, lease land from or have land-use rights recognized by the state; (2) economic organizations that receive land-use rights by transfer; (3) communities of citizens whose use rights are allocated or recognized by the state; (4) domestic households and individuals, who are allocated land by the state, lease land from the state, have land-use rights recognized by the state or receive a transfer of such rights; (5) religious establishments, which receive land-use rights through state allocation or recognition; (6) foreign organizations with diplomatic functions, to which the state may lease land; (7) certain Vietnamese residing overseas, to whom the state may allocate or lease land; and (8) foreign organizations and individuals investing in Vietnam, to whom the state may lease land (GOV Law on Land 2003). The law authorizes the state to allocate land to certain entities for particular kinds of use. These include: (1) households and individuals working directly in agriculture, forestry, aquaculture or salt production; (2) agricultural cooperatives using land for direct service production in agriculture and forestry; and (3) communities using agricultural land. In these cases, the holder of the use right is not required to pay use fees. Holders of other allocated use-rights are required to pay use fees, including, for example, households and individuals using residential land, and economic organizations using land for agriculture, forestry, aquaculture or salt production (GOV Law on Land 2003). In the case of certain other use rights, the state leases out land and requires the user to pay annual rent or a one-time payment for the entire lease term. Rights in this category include: (1) those of households and individuals to use land for production in agriculture, forestry, aquaculture and salt production; and (2) various entities implementing investment projects (GOV Law on Land 2003). The 2003 Law on Land includes a kind of communal land tenure, stating that, “land allocated by the State to a community of citizens shall be used to preserve the national identity through the habits and customs of ethnic minority people.” Vietnam’s legal system has not recognized customary laws since 1975. In some areas, however, occasional remnants of customary communal land tenure can be found. For example, a World Bank study found that communal land-tenure rules have remained predominant over state rules in some provinces, with land being allocated to households each year by a village elder. In these areas, individual private land-tenure rights were not widespread and were not locally recognized (GOV Law on Land 2003, Art. 71; Phan 2011; Andersen 2011). There are numerous means by which Vietnamese may acquire rights to land. One is through state allocation or lease, which typically means that an authority assigns usage of a specific land plot to a particular land user. When collectivized agricultural land was redistributed in the late 1980s and early 1990s, allocation played a primary role in providing farmers access to agricultural land in north and central Vietnam. Land users can also acquire land-use rights through inheritance or grant from family members, through land market transactions, and as the result of land reclamation efforts. For firms and other organizations, state allocation continues to be a primary means for acquiring access to land (World Bank 2010b). The predominant means by which households have acquired rights to land may vary by region. Findings from a 2001 study of 400 farm households in four provinces found that a high percentage of land was acquired through allocation in the north, whereas in the south more users had acquired land through inheritance (Marsh and MacAulay 2006). There are three main mechanisms through which investors can acquire land-use rights from the state: (1) allocation, whereby the state adopts an administrative decision to grant use rights to a national entity; (2) recognition, also available for national entities only; and (3) leasing, in which the state provides use rights on a contract basis to national and foreign entities. Foreigners may only obtain use rights through lease and must pay a land-use rent. In the case of foreign entities, leases must be based on economic or technical justifications approved by a state body. Articles 80 through 84 of the 1993 Land Law contain provisions regarding the leasing of land to foreigners (Embassy of Vietnam 2012; Haque and Montesi 1996). Land-use right certificates (LURC) signify formal state recognition of a user’s rights, and are necessary for secured tenure, formal land transactions, access to formal credit and legal protection of land-use rights. They also contain information on the land user and the land parcel, and description of the property (Tran Nhu 2006). The 2003 Law on Land required the state to establish land registration offices in all provinces for the registration of land transactions. Under this law, all parcels and any attachments to land are to be registered in one system (Do 2006). At the province, district, city and town levels, People’s Committees handle the allocation of land and issuance of LURCs to households and individuals, communities of citizens, religious organizations and establishments, and overseas Vietnamese. They are also responsible for procedures of transfer and exchange of land-use rights, except in rural areas, where these responsibilities belong to People’s Committees at the commune level (FAO 2012a; GOV Law on Land 2003). In cases where a particular parcel has multiple users, whether individuals, family households or organizations, the state should issue certificates to each co-user. Under the Marriage and Family Law, land acquired during a marriage is deemed a common asset. That law requires that the names of both husband and wife be registered on LURCs. Additionally, the 2003 Law on Land requires that LURCs include the name of both husband and wife if the land is a mutual asset. If the wife’s name is on the certificate, her rights to the land are protected in the case of separation, divorce or the death of her husband. These laws are not being implemented fully. As of 2010, only about 30% of LURCs included the names of both spouses. This figure appears to refer to LURCs for both agricultural and non-agricultural land, and the percentage for agricultural land alone may be lower, as discussed further below (GOV Law on Land 2003; Hatcher et al. 2005; World Bank 2010b). While the law gives households the right to sell, rent, exchange, mortgage and bequeath their land, many do not have the right to determine how they use their plots. The state predetermines land-use designations (Markussen et al. 2009; World Bank 2010b). Although the 20-year land-use rights that the state granted to land users in 1993 will expire in 2013, criteria and procedures for extending their duration are unclear. This contributes to a perception of insecurity and affects the security and certainty of rights in practice. A new land law, which the National Assembly began considering in October 2012, is expected to address the expiring rights. Reports indicate that the new law will tend to preserve existing allocations of those with expiring use-rights (World Bank 2010b; Hiebert 2012; Kirk and Tran 2009). A number of factors prevent women from asserting their land rights. These include the following: laws with inadvertent impacts; lineage practices; biased mediation groups and committees; biased testamentary (will-related) practices; lack of access to legal services; lack of enforcement and male privilege (Cầm et al. 2012). Vietnam’s laws emphasize gender equality, including with regard to land-use rights. The Constitution prohibits all forms of discrimination against women, and states that men and women have equal rights in the family and in political, economic, cultural and social fields. Other laws provide that women have the same rights as men to engage independently in civil transactions, contracts, property management and justice mechanisms. Article 8 of the Civil Code provides that men and women are equal in civil relations (Hatcher et al. 2005). The Marriage and Family Law establishes that all land acquired during marriage is considered a common asset, while the 2003 Law on Land requires that LURCs bear the names of both spouses if a land-use right is shared property. By law a wife has the same rights and obligations as her husband in the use, possession and disposition of common property (GOV Law on Land 2003; GOV Marriage and Family Law 2000). When the 1993 Land Law entitled farmers to trade, transfer, rent, bequeath and mortgage their land-use rights, the change was implemented through the issuance of LURCs at the household level. Though these reforms used gender-neutral language, disparities resulted during implementation. Initially, the LURCs had space for only one name, which was used to record the name of the household head. As men were more often household heads, more men than women had their names on LURCs (Menon and Rodgers 2012; Ravallion and van de Walle 2008). Although a 2001 decree required that the names of both spouses be listed for jointly held land, government departments responsible for implementation lacked capacity, local officials reportedly reverted to traditions and customary practices favoring men, and the requirement was not well enforced (Menon and Rodgers 2012; Ravallion and van de Walle 2008; Hatcher et al. 2005). The inclusion of women’s names on LURCs is intended to protect their rights in the case of separation, divorce, or the death of a husband. However, inclusion continues to be low. In the most comprehensive study of women’s access to land rights to date, groups following matrilineal succession reported 11% joint certification over non-residential land, and ethnic minority groups practicing patrilineal succession reported 4.2%. Those from matrilineal groups reported the highest levels of sole certification for wives (21.1%) as compared to non-Kinh patrilineal groups (15.7%). As for residential land, only 22% of married women are listed jointly with their husbands, and 19% solely (Hatcher et al. 2005; Cầm et al. 2012). Without their names on land-use certificates, women are, in practice, subject to customary practices, which leave them without a share of family assets acquired after marriage in the case of divorce. In the case of a husband’s death, widows often see a son’s name, rather than their own, recorded on the land-use certificate (FAO 2012a). The Marriage and Family Law requires that the purchase, sale, exchange, giving, borrowing and other deals relating to large-value (joint) property shall be agreed to by wife and husband. However, authority over property generally shifts to husbands upon marriage, and the amount of authority each spouse enjoys depends on cultural practice, social position in the community, language and economic status (GOV Marriage and Family Law 2000; Tran 2001; Cầm et al. 2012). Though by law women are provided land-use rights equal to men’s, their access to and control of land remains low. Many localities have allocated land on the basis of the age of household members, with working-age individuals receiving larger allocations than others. Female-headed households often have fewer working-age adults, and have therefore tended to receive smaller allotments than male-headed households. Size of allotment is often affected by the assignee’s retirement age, which is 55 for women and 60 for men, with the result that women are typically awarded smaller plots. Of the 12 million farmers allotted land by the end of 2000, only 10% to 12% were women (Menon and Rodgers 2012; Hartl 2003; CEDAW 2005). Vietnam’s laws on inheritance and succession provide for gender equity that does not exist fully in practice. While men and women have equal rights to transfer property and to inherit according to testament or the law, the law also gives primacy to parental wills. In the vast majority of cases, excepting bilateral and matrilineal groups, families that divide property before death do so without regard to gender equity, and based on a variety of factors, including male preference and customary practice. Where there are both male and female children, males typically inherit property while daughters may inherit a smaller share or be excluded entirely. Due to the prevalence of patrilocal residency (the practice of married couples settling with or near the husband’s family) and to expectations that sons maintain ancestral rites, daughters in families following patrilineal practices do not inherit land equally with their brothers (Cầm et al. 2012). Succession and inheritance laws that apply in cases of intestate deaths (i.e., in cases where there is no testamentary will) include provisions that can create difficulties for women. For example, a “spouse” is considered under the law to be a member of the first order of succession. The definition presumably refers only to a legal spouse, as according to law there can only be one, meaning that, in areas practicing polygyny, the inheritance rights of second and third wives are vulnerable (Cầm et al. 2012). Confidence in the willingness of Vietnamese courts to uphold equal rights is reportedly high, though there is concern regarding the lack of mechanisms available for enforcing court decisions. Despite confidence in courts, data show that they draw on the law selectively and decide cases based on overlapping concerns including family, kinship and local cultural practices. Courts have also been shown to exclude women’s rights by failing to consider such rights unless a female plaintiff explicitly makes a claim against property in court. In these situations, the customary practice of dividing property among sons can supersede laws on succession (Cầm et al. 2012). Several factors strongly discourage women from accessing legal services, which in turn affects their ability to exercise their land rights. Lower education and language levels are common barriers, particularly for ethnic minority women, as all formal legal affairs must be conducted in written Vietnamese. Notions of women’s lower social status and perceived inability to interact with formal legal institutions also discourage women from seeking legal assistance. In addition, women have reported factors preventing them from accessing legal services, including a reluctance to deal with complicated bureaucratic processes and a sense of disempowerment when interacting with government representatives (Cầm et al. 2012). Vietnam’s land policies are administered through a hierarchy of authorities at the central level, across 61 provinces, across more than 500 districts and across more than 10,000 communes (Huyen and Ha 2009). The country has a unified and decentralized system of state land management and administration set out in the 2003 Law on Land. In addition to establishing systems at all levels, this law concentrated policy formulation and supervision of implementation at the central level and distributed roles among numerous central agencies including the administrations of justice, natural resources, construction, agriculture, finance and planning and investment. As provided for in the 2003 Law on Land, the state makes decisions on provincial and city land use zoning and planning and exercises uniform administration of land throughout the country. The National Assembly promulgates laws on land, makes decisions regarding national land use zoning and planning and exercises supreme supervision of land administration and use throughout the country. Based on issues presented by the government, the National Assembly’s Standing Committee decides policies regarding land use rights and quotas assigned to family households and individuals (FAO 2012a; GOV Law on Land 2003). The Ministry of Natural Resources and Environment (MoNRE) is the primary central-level administrative body for land, water and mineral resources. It is charged with the state administration of land, directing and organizing inspections of land nationwide and directing the surveying, measurement, drawing and management of cadastral maps, land use status maps and land use zoning maps nationwide. In addition, it provides regulations on cadastral files and guidelines on their formulation, revision and management and issues LURCs (FAO 2012a; GOV Law on Land 2003). Below the central level, provincial and district entities and commune People’s Committees carry out responsibilities for land policy implementation with support from provincial or district departments for Natural Resources and Environment and commune cadastral officers (World Bank 2010b). People’s Committees at all levels serve as organs of state administration. In provinces and cities, they issue certificates of land use rights to religious organizations and establishments, Vietnamese residing overseas and foreign organizations and individuals; direct the implementation of land use zoning and planning of their locality; and inspect implementation of land use zoning and planning by local authorities of the lower level (FAO 2012a). People’s Committees at the provincial city (a unit of administration distinct from province or city), district and town levels are responsible for allocating land and issuing land use right certificates to households and individuals, communities of citizens and Vietnamese residing overseas who purchase residential housing attached to residential land. They are also responsible for all procedures of transfer and exchange of land use rights, except in rural areas, where these responsibilities belong to the People’s Committee at the commune level (FAO 2012a). People’s Committees at the township, ward and commune levels are responsible for settling land disputes which conciliation efforts are unable to solve, and for which legal documents for the disputed land exist. Where documentation is absent or insufficient, such disputes are brought to the city or province-level People’s Committee or, if the parties disagree with the city or province People’s Committee, to the Minister of Natural Resources and Environment for resolution. These also organize and direct implementation of land use zoning and planning of their localities, and identify and prevent land use which is inconsistent with the land use zoning and planning (FAO 2012a; GOV Law on Land 2003). Land Registration Offices, established in all provinces and a third of districts, provide land-related public services. These offices lack consistent organizational, staffing and service standards as well as the capacity to meet increasing demands from land users (World Bank 2010b). The Land Inspectorate is charged with inspecting how well state bodies and land users comply with land laws and with preventing and resolving breaches of the law (FAO 2012a). As discussed above, land is a scarce resource in Vietnam, which has one of the world’s lowest land endowments on a per capita basis. There is evidence that prices for both rented-in cultivated land and cultivated land obtained by auction have increased significantly since 1997 (World Bank 2010b; Marsh and MacAulay 2006). The 2003 Law on Land governs the circumstances and conditions under which land-use right holders can sell, lease, sublease or mortgage their rights or assets attached to leased land. Transfers: require the transferor to possess a registered LURC; must be for a period within the term initially granted to the transferor; and cannot involve land under dispute (GOV Law on Land 2003). The legal status of transferors and transferees (e.g., status as an organization or household, or as a foreign or domestic entity) also constrain the ability to transfer and receive rights. For example, foreign investors cannot buy land-use rights directly from LURC holders and must instead negotiate with the government. The means by which a transferor acquired land-use rights, whether by allocation or lease, also affects the transferability of use rights. In addition, a transferee can only use a land parcel in a way consistent with the use purpose that the state has assigned to that parcel, which is listed on the LURC. Thus, if a parcel has a residential use purpose, the transferee cannot use the land for agriculture, and vice versa. Those wishing to change a parcel’s use purpose must obtain official permission (GOV Law on Land 2003; Marsh and MacAulay 2006). People’s Committees at the commune level (for rural areas) and at the provincial, district or town levels (for other areas) are responsible for approving transfers and exchanges of land-use rights (Ngo 2005; FAO 2012a; GOV Law on Land 2003). Data indicate that Vietnam has an active market for land-use rights, though the volume of transactions varies considerably between provinces. The country’s decollectivization of farms in the late 1980s and issuance of LURCs have been identified as having triggered the emergence of land lease and land transfer (chuyen nuong dat) markets (Marsh and MacAulay 2006; Kirk and Tran 2009; Ngo 2005). Bureaucratic processes may be a limiting force. Research suggests that local state entities play an active role in setting the terms for land transactions in order to prevent poor families from selling their lands, which would subject them to the dynamics of the land market. Such restrictions may have the unintended effect of worsening outcomes for the poor by driving transactions underground and forcing poor sellers to accept less favorable terms (Kirk and Tran 2009). Specifically with regard to rentals, legal restrictions on lease periods are so constraining as to inhibit leasing. Under the 1993 Land Law, those with use rights cannot lease out their rights for more than three years (Haque and Montesi 1996). Lack of transparency is a key obstacle to the emergence of a more functional land market. Vietnam has been ranked since 2006 as one of the world’s least transparent real estate markets (World Bank 2010b). The government’s intervention in the allocation, transfer, use and valuation of land also frustrates the development of a free market in land-use rights. Additionally, the costs associated with registering transfers of land-use rights, time-consuming procedures, rent-seeking behavior in peri-urban areas, and unclear regulations have led to many transfers and use changes occurring illegally (Marsh and MacAulay 2006; World Bank 2010b). In explaining the difficulty they encounter in purchasing land-use rights, farmers have cited several factors, including: inadequate access to credit; a lack of available land, particularly in northern communes; and a lack of available farm labor (Marsh and MacAulay 2006). Vietnam’s policy on compulsory acquisition is laid out in the 2003 Law on Land, which characterizes the state’s acquisition as its “recovery” of the public’s right to land from private users who have exercised use rights to it. Under the 2003 Law on Land, compulsory acquisition is permitted for the following purposes: national defense and security; national interest; public interest; and economic development. Economic development is defined as “cases of investment in construction of industrial zones, high-tech zones, economic zones and large investment projects as stipulated by the Government.” The law also establishes the procedures the state must observe (including the procedure for assessing the price of land to be taken) and sets out the rights and obligations of households, individuals, domestic economic organizations and foreign investors in the compulsory acquisition process (GOV Law on Land 2003, Art. 40; World Bank 2011a). Decrees 17, 69, 84, 181, 188 and 197 guide the implementation of the 2003 law. These decrees limit the circumstances under which compulsory recovery is allowed, and address, among other things, land valuation methods and compensation, as well as the state’s obligation to resettle and otherwise provide support for those whose land is taken (World Bank 2011a; CIEM 2006). Those with rights to land may also face recovery by the state in a variety of other circumstances. If the user dies without an heir, the right is lost and control over the land reverts to the state. If the user misuses the land or violates use terms, the user may lose the right. For example, where land designated for annual crops is not used for 12 consecutive months, the state may determine that the user has forfeited the right (GOV Law on Land 2003). People’s Committees of districts, provincial cities and towns are responsible for deciding whether to recover land from households, individuals, communities of citizens and certain overseas Vietnamese. In cases involving organizations, religious establishments, foreign entities and certain Vietnamese residing overseas, these decisions are made by People’s Committees of provinces and cities (GOV Law on Land 2003). By law, compensation for recovered land must correspond with market price. In practice, however, there are no specific procedures for assessing market value, and provincial People’s Committees determine land prices. Households and individuals whose agricultural land is recovered are entitled to compensation in the form of land that has the same use purpose, or, if no such land is available, to a cash amount equaling the price of land with the same purpose (World Bank 2011a; GOV Decree 69/2009/ND-CP 2009a). In addition to addressing the matter of compensation, the 2003 Law on Land requires provincial and district People’s Committees to give notice to parties facing land recovery, and provides that those losing their land have the right to make a complaint against a decision for recovery (GOV Law on Land 2003). The most common type of recovery case involves the state’s acquisition of land from farming households for the development of industrial zones and clusters. By 2005, the state had taken land from over 100,000 households for the development of more than 190 industrial zones and clusters. Although the conversion of land – including agricultural land – is an important source of land supply for the private sector, conversions have been criticized for their adverse impact on poor households in rural and peri-urban areas. Such impacts include livelihood disruption, social and cultural dislocation and negative impacts on food security arising from large-scale conversions of paddy land to other uses (CIEM 2006). Vietnam’s current procedures for recovery and reallocation are said to be slow, unpredictable and lacking in transparency. Administrative complaints regarding land account for 70% of complaints and disputes that are directed toward the government each year, and 70% of these relate to compensation and resettlement. Widespread hostility surrounds the issue of compensation, and, in some cases, violence has erupted as a result of disputes. Reasons behind this hostility include: the fact that authorities use subjective approaches to determine land values, which they often set below market rate without consulting displaced households; that land users are compensated on the basis of their existing use, rather than for the increased value that will result from the conversion of their land; that valuations vary across administrative boundaries, which can mean different rates are applied to adjacent plots; and disputes over plot measurements, which sometimes differ from measurements in land records (World Bank 2010b; CIEM 2006). The state’s introduction of private use rights in 1993 led to conflicts with numerous ethnic communities. The new model of individual use rights tied to specific land parcels did not apply easily to minority group land-use practices, which tend to rely on shifting cultivation and forestry. Some communities, preferring to maintain traditional collective management systems, refused to accept individual land-use certificates and the privatization of use rights. Conflicts were particularly severe in the central highlands, where national army and police forces deployed in 2001 and 2003 to quell protests by thousands of ethnic minority people (Ravallion and van de Walle 2008; Andersen 2011). Perhaps in response to the unrest, the 2003 Law on Land provides for a kind of communal tenure by recognizing that the state may allocate land to a “community of citizens.” Although this means it is now legally possible to institutionalize communal land tenure, institutionalization has not occurred in practice, and the potential for conflict remains (Andersen 2011). Conflict also surrounds the competing demands of various groups for agricultural land and forestland. Ethnic minorities, local farmers and forest dwellers, recent migrants and state forest enterprises often have conflicting interests. However, processes for resolving them in an economically, socially and environmentally sound way have not yet been developed. Conflicts have been rife in parts of the central highlands, which have seen particularly large population in-migration. Between 1976 and 2001, the population more than tripled in the central highlands as mostly lowland Kinh (Vietnam’s ethnic majority group) migrated to the area and occupied communal land occupied by ethnic minorities (World Bank 2010b; Writenet 2006; Andersen 2011). The growing coffee industry brought many newcomers to the central highlands area in the 1980s and 1990s. Between 1976 and 1996, Dak Lak province received 311,000 migrants (many of them ethnic minorities), a number exceeding the area’s entire indigenous population. Conflict has arisen as locals are pushed from their lands and as migrants clear forestland, fallowing swidden lands or community fields that appear to be unoccupied (Writenet 2006). The number of large-scale land disputes has increased since the beginning of 2012. Among these disputes are numerous high-profile conflicts relating to compulsory acquisition. As discussed above, compensation for expropriated land often falls below market price despite legal requirements. Disputes over compensation sometimes result in violence. By law, district-level officials have the authority to forcibly evict land users who refuse to relocate; there have been a string of forced evictions in rural areas, in some cases involving military forces (Hiebert 2012; CIEM 2006; Ravallion and van de Walle 2008). In April 2012, authorities in Van Giang deployed 3000 police to pacify approximately 1000 villagers protesting inadequate compensation and consultation relating to a development project. This situation and others involving claims of inadequate compensation for expropriated land have been referred to as “land grabs” (Hiebert 2012; Tran 2006; Radio Free Asia 2012). Mediation groups, which operate at the street and village level, and mediation committees, which operate at the commune and neighborhood level, play an important role in adjudicating property disputes between individuals. Both are comprised of influential community members. Committees typically include officials from the justice department, the police and the country’s Fatherland Front, and representatives from groups such as the farmers’ union, women’s union, Veterans’ Association and the Communist Youth Union. Although individuals on these committees do not formally act as state representatives, the state is invested in the committees as a matter of policy, and views them as important institutions for handling small disputes. The 2003 Law on Land states explicitly that the “State encourages parties to a land dispute to conciliate by themselves or to resolve the land dispute by conciliation at the grass-roots level” (GOV Law on Land 2003 Art. 135; Cầm et al. 2012). Mediation committees often prevent women from realizing their land rights, as they tend to resolve disputes according to custom rather than law, particularly in areas where patrilineal groups dominate. While committee decisions are not binding, and complainants may pursue their claims through the formal legal system as well, those who use the mediation process face significant pressure from their community and the committees to end their grievance at the committee level (Cầm et al. 2012). According to the 2003 Law on Land, parties who fail to resolve their land disputes through conciliation are to refer their complaints to the People’s Committee of the commune, ward or township where their land is situated. If a dispute continues past that point, the committee will refer parties to one of several places – a people’s court, a People’s Committee at a province or city level or the Minister of Natural Resources and Environment – depending on the details of the case (GOV Law on Land 2003). Parties with complaints about administrative decisions made by People’s Committees can bring their complaint before various levels of People’s Committees and in some cases to People’s Courts (GOV Law on Land 2003). The World Bank and AusAid are currently funding a five-year Land Administration Project aimed at improving the quality and timeliness of land-use administration and increasing access to land information services. The project, which MoNRE is implementing in nine provinces, intends to accomplish the following: modernize land administration and information systems; raise public awareness about land administration and certification; and increase public participation in the land-use rights certification process, especially for ethnic minorities. It also involves issuing or re-issuing LURCs through a streamlined application process. As of June 2012, over 500,000 LURCs had been issued under the project (World Bank 2011b; World Bank 2012b; World Bank 2012e). USAID and other donors have focused projects on improving conditions for ethnic minorities, the rural poor and other marginalized communities. USAID’s efforts related to land include improving access to agriculture extension services and increasing education on horticulture and animal husbandry. The Asian Development Bank (ADB) is currently funding projects to improve rural infrastructure, including irrigation systems and access infrastructures in the central highlands, and to resettle ethnic minorities displaced by a hydropower project (USAID Vietnam 2012; ADB 2012a; ADB 2012b). Vietnam has a dense network of 2373 rivers longer than 10 kilometers, about 3600 reservoirs and many natural lakes. There are 17 major river basins in the country, the largest of which are the Red and Thai Binh, the Mekong, the Dong Nai-Saigon and the Ma-Chu, which together account for the vast majority of Vietnam’s surface water. Wetlands comprise 7–10 million hectares of Vietnam’s total land area, at least half of which are located in the Red and Mekong river deltas. Vietnam’s freshwater resources support a high level of biodiversity, including many rare and endangered species (WEPA 2012a; WEPA 2012b; Nang 2003). The country also has abundant groundwater, with reserves of nearly 60 billion cubic meters per year. Less than 5% of the total groundwater reserves are used annually, and the volume of groundwater used varies by region. Overexploitation of aquifers in some areas, like the Mekong Delta, has led to falling water tables and salinity intrusion, especially in coastal regions. Groundwater pollution is another concern, though overall water quality remains generally good (WEPA 2012a; World Bank 2010b). Ninety-five percent of Vietnam’s freshwater withdrawals are for agriculture, which employs 52% of the nation’s total labor force and approximately 70% of rural households. Approximately 45% of Vietnam’s agricultural land is irrigated. The remaining freshwater withdrawals are for industrial (4%) and domestic use (1%). Vietnam also relies on hydropower to produce about one-third of its national power capacity, and approximately 50% of Vietnam’s hydropower production comes from dams in the Red and Thai Binh and Dong Nai river basins (World Bank 2012a; World Bank 2010b; CIA 2012; FAO 2009). Vietnam receives ample total rainfall, averaging 1821 millimeters annually. However, precipitation is uneven across regions and uneven throughout the year. About 60% of all river water is found in the Mekong River Basin and the remaining 40% of river water supplies almost 80% of the country’s total population. Vietnam’s weather patterns produce periods of heavy rainfall followed by a long dry season, so that in reality, water is fully available only for 20–30% of the year. The wet season, characterized by typhoons, storms and flooding, presents its own dangers, while the dry season leads to water shortages in some parts of the country. Vietnam’s water supply is also vulnerable because more than 60% of its surface water flow originates in other countries (World Bank 2012a; World Bank2010b; GOV 2006b; WEPA 2012a). Freshwater quality in Vietnam varies, although water pollution is becoming an increasing concern as urbanization and industrialization rapidly expand. Although the quality of most upstream river water remains generally good, quality deteriorates downstream due to an increasing amount of urban and industrial pollution. The Vietnam Environment Monitor has declared sections of some rivers as “dead zones,” meaning that they are unable to support life. About half of the total population lacks an adequate supply of clean water, and even fewer have access to adequate sanitation. In rural areas, although about half of the population has sanitation facilities (often in the form of a septic tank), only 18% of those facilities meet Ministry of Health hygienic standards. Additionally, 90% of domestic wastewater and 70% of industrial wastewater is not treated. Conditions are worse during the dry season, as lower surface water levels mean higher concentrations of pollutants (WEPA 2012a; World Bank 2007; World Bank 2010b; ADB 2010). Climate change is expected to negatively affect Vietnam’s freshwater resources in the following ways: exacerbating and making its existing extreme weather cycles more unpredictable; raising sea levels; increasing freshwater salinity; and reducing the total amount of freshwater resources by exacerbating the long dry season (WEPA 2012a; World Bank 2010b). Under Vietnam’s constitution, all governmental entities, private businesses and organizations, and individual citizens must observe state regulations regarding natural resources and environmental protection and must refrain from any acts that deplete or destroy the environment. The 2005 Law on Environmental Protection strives to protect the environment to promote social progress and sustainable development of the nation. Under this law and regulations following from it, the government has set environmental standards, including specific ambient standards on certain pollutants for surface and groundwater, and effluent standards for waste flowing into water resources. The law also requires industries and projects to complete assessments of environmental impacts, including impacts on water quality (GOV Constitution 1992; GOV Law on Environmental Protection 2005; WEPA 2012a). The Law on Water Resources provides a framework for managing, protecting, exploiting and using water resources. In June 2012 the National Assembly passed a revised Law on Water Resources, which includes a strengthened licensing system for water use and wastewater discharge, encourages conservation, decentralizes water management responsibilities, and requires the state to invest in scientific research and improve water resources management. The new law will enter into force in January 2013 (Vietnam News 2012; VietnamPlus 2012; GOV 2012b). Under the 1998 Law on Water Resources, Vietnam’s water is owned by the entire people, and falls under the unified management of the state. People have the right to use water resources for living, agriculture, forestry, industrial production, mining, electricity generation, transportation, aquaculture, sea fishery, salt making, sport, recreation, tourism, medicine, health rehabilitation, scientific research and other purposes. However, other than for use of small amounts of water for household purposes, each person or organization using water resources must obtain permission from the relevant national or local agency. Although the current Law on Water Resources does require users to obtain permission, it does not define the parameters of the licensing system or set quantitative limits on water use. This may change under the 2012 version of the law, due to enter into force in 2013 (GOV Law on Water Resources 1998; World Bank 2010b). The Ministry of Natural Resources and Environment (MoNRE) protects, oversees and manages the quality and quantity of national water resources. The agency has devolved some of its authority to provincial authorities that handle the issuing of licenses, environmental management and other local water-related matters (World Bank 2010b; WEPA 2012a). Although MoNRE is the lead agency regarding water resources, others also have duties with respect to water: the Ministry of Industry and Trade oversees hydropower; the Ministry of Science and Technology appraises and publicizes water quality standards; the Ministry of Construction designs and builds water supply and sewage works; and the Ministry of Health manages drinking water. The state has taken several measures in recent years to improve its water management system. It adopted a new Law on Water Resources in 2012 and a stronger Law on Environmental Protection in 2005. The state has also developed a National Water Resources Strategy, a National Target Program (NTP) for Rural Water Supply and Sanitation, and a NTP to Respond to Climate Change. MoNRE also drafted a NTP on Improvement of Efficiency for Water Resource Protection, Management and Multipurpose Use, which includes a US $500 million investment over ten years to establish a water resources monitoring system (World Bank 2010b; ADB 2009; GOV 2010b). High priority projects under the National Water Resources Strategy include: conducting an inventory and assessment of water resources; agreeing on priorities for water allocation and regulation in the event of a water shortage; implementing agricultural changes that will make more efficient use of water, such as restructuring crop patterns and developing a management mechanism for irrigation; and protecting groundwater (GOV 2006b). Several non-governmental organizations, governmental aid agencies and multilateral organizations have worked with the Government of Vietnam to improve the nation’s water quality and management. The World Bank is funding several water-related projects in Vietnam. Three projects were approved in 2012. One focuses on mitigating national hazards, including floods, storms and droughts. Another project focuses on upgrading urban infrastructure, including sanitation facilities and sewers, in urban areas of the Mekong Delta. The third project aims to improve integrated water resources management in the Mekong Delta region at the regional, national and sub-national levels (World Bank 2012c). ADB has provided technical assistance and loans to help improve Vietnam’s water sector. Recent projects include: improvements to the collection, treatment and disposal of urban wastewater; capital investment in Vietnam’s water companies and National Nonrevenue Water Program; and recommendations for the sustainable provision of safe water in Da Nang (ADB 2012c). Australia and two other donors currently provide funding and technical assistance to help Vietnam implement its National Target Program on Rural Water and Sanitation. Now in its third phase, the project aims to improve water and sanitation by building latrines and promoting safe hygiene practices (AusAID 2012). Western NGOs, including PATH and East Meets West, conduct safe drinking water and sanitation projects in Vietnam (East Meets West 2012; PATH 2008). In 1992, the Vietnamese government began long-term reforestation efforts to promote planting on “barren hills” and to enrich existing forests. At that time, most forests and plantations had been degraded and had shrunken to comprise only 27% of Vietnam’s land area. The program has been a success. As of 2010, Vietnam’s annual afforestation rate was about 1%, and 44% of its land area (13,797,000 hectares) was forested. Vietnam has highly biodiverse and varied natural forests, including evergreen and semi-evergreen broad-leaved forests, semi-deciduous and dry deciduous forests, mixed evergreen coniferous forests and mangroves. Approximately 1% of forestland is primary forest (naturally regenerated forest of native species without clear indication of human activities), 74% is other naturally regenerated forest (naturally regenerated forest with clear indication of human activities) and 25% is planted forest (forest composed mainly of trees established through deliberate planting and seeding) (World Bank 2012a; World Bank 2010b; RECOFTC 2011; FAO 2010). Approximately 25 million people, many of them ethnic minorities in remote areas, live in or near forests, though access to forestland varies. In the northwest region, half of all ethnic minority households report using forestland, whereas in the central highlands, which hold the country’s largest forest area, only 4% of ethnic minorities report having forest use access. Among all forest dwellers, poverty levels are generally high, and most rely on forest resources to meet their basic needs or to supplement their income between agricultural harvests or during emergencies. Several ethnic minorities attach political, cultural and spiritual significance to the forestland as well. By the end of 2009, ethnic minorities held certificates to 1% of all Vietnam’s forestland (World Bank 2010b; World Bank 2008; IWGIA 2011). Vietnam’s forests fall into three functional categories: (1) special-use forests used for national parks and nature reserves (about 15% of total forest area); (2) protection forests meant to protect the environment, regulate climate and prevent erosion, desertification and natural disasters (38%); and (3) production forests used for producing and trading timber and non-timber forest products (46%). Though all forestland is owned by the state, about 24% is held privately under allocation or long-term lease. Privately held land includes land held and managed by individuals, households, communities, private cooperatives or privately owned businesses or organizations. The private sector manages about 70% of production forests, 30% of protection forests and15% of special-use forests. State operations manage the remaining forests (World Bank 2010b; GOV Law on Forest Protection and Development 2004; FAO 2010; FSIV 2009). The forestry sector as a whole is responsible for about 5% of Vietnam’s annual GDP. Vietnam’s wood processing industry, conducted primarily by private sector enterprises, has grown in recent years, and forest product processing and trade now employs about 520,000 workers. Many others work with forest products at the household or craft village level. In areas with abundant forest cover, income from forestry accounts for 15–40% of total household income. Although the government’s afforestation efforts have increased overall forest area, degradation of natural forestland has continued. Primary causes are the following: illegal conversion of forest to non-forest uses; forest fires; and overexploitation and illegal logging, the latter driven in part by the illegal trade in wood products. Forest degradation has adversely affected Vietnam’s biodiversity. Increasing numbers of species, some of which are found only in Vietnam, have become endangered (World Bank 2010a; World Bank2010b; FSIV 2009; CIRUM 2012). Degradation has disproportionately affected mangrove forests, which covered 400,000 hectares in 1943, but comprised less than 60,000 hectares in 2008. Recognizing the importance of mangroves in mitigating the effects of coastal storms and sea level rise, the government and donors have promoted mangrove protection and rehabilitation efforts, including a community-based management program under which local communities collectively run nurseries, select and source seeds and plant trees to regrow and repair mangroves. Although the area covered by mangrove forest has begun to increase in recent years, the forests remain fragmented (World Bank 2010b; FSIV 2009; Powell et al. 2010). Climate change is expected to strain forestland further as pests, diseases and risk of forest fires increase, and as higher temperatures and rising sea levels impact forest boundaries, biodiversity and distribution of species (World Bank 2010b). The legal framework governing forestland has developed rapidly over the last decade alongside the government’s efforts to promote reforestation, forestland tenure reform and allocation of forest land to private citizens and communities (World Bank 2010a). The Land Law of 2003 classifies forestland as a sub-category of agricultural land. As with other land in Vietnam, no forests are subject to private ownership, but rather belong to the people and are managed by the state. However, private entities, including households, may be allocated or lease forestland for 50 years. Such use rights can be inherited, transferred and exchanged. The state will grant an extension of the allocation or lease term if all of the following are true: the user wishes to continue using the land; the user has observed the land laws during the previous term; and the use conforms to current zoning laws. For large investment projects with slow capital recovery rates or other special circumstances, the maximum use rights period is 70 years (World Bank 2010a; GOV Law on Land 2003). The 2004 Law on Forest Protection and Development categorizes all forestland as belonging to one of three functional categories (special-use, protection and production), and establishes principles and rules for the management, protection, development and use of each type. The law includes, for example, provisions regulating the lease of production forests, and transfers responsibility for protecting the leased forests to the lessees. The Law on Forest Protection and Development also prohibits the following activities: illegal hunting; illegal collection of non-timber forest products; illegal logging; forest destruction; disregard of forest fire prevention and pest prevention regulations; encroachment upon forestland; transport of illegal forest products; and illegal grazing. Violations of these provisions can be administrative or criminal if made so under the Penal Code. The Penal Code makes it a crime to: breach regulations on forest exploitation and protection; breach regulations on forest management; destroy forests; breach regulations on the protection of certain rare wild animals; or breach the special protection regime for nature preservation areas (GOV Law on Forest Protection and Development 2004; World Bank 2010a). Forestland is also subject to the Law on Environmental Protection and the Law on Biodiversity (REDD 2012a). Under Vietnam’s 2003 Law on Land, all land, including forestland, belongs to all the people and is managed by the state. However, forestland is allocated to private entities, including households, for long-term tenure agreements, typically for 50 years with a possible extension. Leases include forest use and ownership rights over planted production forest, meaning that the lessee can, in accordance with relevant laws and regulations, possess, use and dispose of trees, animals and other property associated with the forestland and enjoy the yields and profits from those forest products. These leases can be transferred, exchanged and inherited (GOV Law on Land 2003; GOV Law on Forest Protection and Development 2004; FSIV 2009; World Bank 2010a). About 24% (3,311,280 hectares) of Vietnam’s forestland is formally allocated or leased to private entities, including more than 1.1 million organizations, households and individuals. About 90,000 households and individuals have contracts to protect, plant or regenerate natural, special-use and protection forests. The government, through its Provincial People’s Committees, began piloting a community forest management program in 2004, allocating forest tenure and accompanying responsibilities to communities living on forestland. The project has remained small, and only a minor percentage of the privately held forestland has been allocated for community management (approximately 17,000 hectares to 64 villages). The government intends to allocate another 2.5 million hectares (another 18% of Vietnam’s current forestland) to households and communities (RECOFTC 2011; FSIV 2009; World Bank 2010b; World Bank 2012d). Most forest-related administration and management falls under the Directorate of Forestry of the Ministry of Agriculture and Rural Development (MARD). MARD develops forest policy and provides oversight and guidance for its implementation. Forest protection at a provincial level falls to the provincial Departments of Agriculture and Rural Development (World Bank 2010a; World Bank 2010b; GOV Decree 119/2006/ND-CP 2006a). The Law on Forest Protection and Development provides that the Ministry of Public Security, the National Ministry of Defense and the Ministry of Natural Resources and Environment shall collaborate with MARD at the district and provincial levels to implement forest policy. The number of agencies involved along with the highly decentralized nature of governing agencies has led to weak and ineffective enforcement of forestry laws as well as uneven enforcement across regions (World Bank 2010a). The Government of Vietnam has developed and implemented policies aimed at the following: protecting existing forests; increasing forest cover and production; and allocating use and management rights over forestland to private entities, including households and specific communities (RECOFTC 2011). Vietnam’s 2006–2020 Forest Development Strategy (FDS) builds on an earlier FDS to achieve these objectives. Approximately 4.6 million hectares of trees were planted between 1998 and 2010 under the government’s Five Million Hectare Reforestation Programme. The Programme aimed to accomplish the following: encourage citizens and enterprises to plant trees by allocating forest land rights and management to households and communities; encourage joint ventures and foreign investment; institute benefit sharing policies; and provide technical and financial support to tree planting and forest management efforts. In an effort to mitigate climate change, the government plans to increase forest cover by 45% (approximately 6 million hectares) by 2020. The current FDS also includes a plan to accomplish the following: promoting private tenure and resource access; encouraging households in or near forests to take on responsibility for forest protection at a community level; and extending loans at a preferential rate for tree planting and protection activities. The FDS’s social objectives include: increasing income; eliminating hunger; and reducing poverty by 70% in certain forestry areas by completing forest land allocation and leasing to ensure secure land rights and creating more forestry sector jobs. Allocation efforts under the FDS will prioritize the poor and ethnic minorities (World Bank 2010b; GOV 2012a; UNFF 2005; FSIV 2009; GOV 2007). Vietnam was one of the pilot countries for the UN’s Reducing Emissions from Deforestation and Forest Degradation program (REDD). During 2009–2011, REDD invested US $4.4 million in Vietnam’s reforestation efforts through the following activities: working with MARD to establish forest management tools; conducting pilot projects to build local authorities’ forest management capacity; and conducting public awareness raising campaigns in the country. REDD is now using the success of reforestation efforts in Vietnam as an example as it designs projects for other countries in the region (REDD 2012b; FAO 2012b). The UN Food and Agriculture Organization (FAO) is currently conducting three forestry related projects in Vietnam. FAO is assisting MARD to conduct a national forest and trees assessment as well as a rural poverty reduction project in Quang Nam Province to develop sustainable market-oriented agroforestry. FAO is also funding a Ministry of Industry and Trade project to promote pro-poor, sustainable and “green” value chains for rural handicrafts and furniture, much of which are made from timber and other forest products (FAO 2012b). Vietnam has over 60 mineral commodities, including oil, natural gas, coal, tin, gold, copper, chromium ore, lead, limestone, salt, bauxite, titanium-zircon, apatite, white marble, glass sand and thermo-mineral waters. Most of Vietnam’s mineral commodities are processed and consumed locally, though some are exported. In 2011, heavy industrial products and minerals comprised 36% of Vietnam’s total exports. Total output of the mining and quarrying sector accounted for about 3.7% of GDP in 2011. The mining and quarrying sectors employ less than 1% of all employed workers in Vietnam (Fong-Sam 2012; World Bank 2010b; Nguyen 2010; GSO 2011a; GSO 2011b; GSO 2011c). Vietnam’s petroleum and natural gas production is significant and has increased steadily over the last two decades, though the industry operates mainly offshore. Operating within the country’s land territory, Vietnam’s largest mining operation is coal. Vietnam’s largest coal operations are in Quang Ninh Province in the northeast of the country. Vinacomin, the state-owned minerals enterprise, is currently evaluating the real reserves of coal in the Red River Delta Basin, Vietnam’s largest deposit of coal, and plans to mine the area in the future. In 2010, Vietnam produced 49.2 million tons of coal, about 48% of which was exported, largely to China and Japan (World Bank 2010b; USEIA 2012; Wu 2009; VietNamNet Bridge 2012). A thriving mining and quarrying sector promotes socioeconomic development, but also poses negative physical and social consequences for the country. Potential negative impacts include: harm to the physical environment from exploration and extraction activities; and creation and exacerbation of social tensions regarding development of new mining projects and distribution of benefits. For instance, in 2008 coal mining in Vietnam produced 285 million tons of waste rock and soil, and caused dust pollution exceeding permitted standards, having a significant health impact on nearby residents. It also: caused a loss of usable land area, some of which was previously agricultural; produced a large amount of wastewater discharge, contributing to the acidification of surface waters and groundwater; and led, in some localities, to overall reductions in rice yields (World Bank 2010b). Climate change is expected to negatively impact Vietnam’s mineral resources. Rising sea levels may lead to mine flooding, and the resulting salinization and corrosion will degrade mineral quality. Flooding from higher sea levels and more frequent extreme weather may also spread mining contaminants and cause difficulties in mineral exploration and extraction (Nguyen 2010). The Mineral Law of 2010 replaced Vietnam’s 1996 Mineral Law (which had been amended in 2005). Under the new Mineral Law and its corresponding regulations, the state administers Vietnam’s mineral resources by regulating geological surveys, mineral exploitation, mining and overall management of the nation’s unexploited minerals. The state develops an overall mineral strategy and master plan for specific minerals to encourage efficient and effective mining practices and sustainable development in the mining and quarrying sector. Under the Mineral Law, the Ministry of Natural Resources and the Environment (MoNRE) leads the overall development of the mineral strategies, which must be approved by the Prime Minister. Master plans, developed by the assigned government ministry and approved by the Prime Minister, include projects and production targets for five to ten years and an outlook for ten to twenty years. The Mineral Law also allows the state to collect revenue from mining entities that can assist in promoting local socioeconomic development, and encourages the export of minerals after local needs are met (Fong-Sam 2012; GOV Mineral Law 2010a; Mayer Brown JSM 2012; World Bank 2010b). The mining and quarrying industry is also subject to the 2005 Law on Environmental Protection, which requires that parties proposing mining projects prepare environmental impact assessments with social impact components. The state collects fees from mining entities, which go to provincial budgets and support environmental protection and cleanup efforts. Fees intended for protection often go instead toward remedying existing pollution and degradation issues (World Bank 2010b; GOV Law on Environmental Protection 2005; GOV Order 05/2008/L-CTN 2008a). The Mineral Law does not cover oil and natural gas operations. These fall under the Petroleum Law of 1993 (amended in 2008), which vests in the state all authority to manage petroleum resources. The Petroleum Law and its corresponding regulations establish requirements for businesses in the petroleum sector, the licensing system for exploration and extraction and management principles for Vietnam’s state-owned petroleum company, PetroVietnam. The 2008 amendments to the Petroleum Law included anti-corruption measures and provisions to make the sector more attractive to foreign investors (GOV Petroleum Law 1993; GOV Decree 63/2008/ND-CP 2008b; GOV Decree 115/2009/ND-CP 2009b; Global Trade 2011). 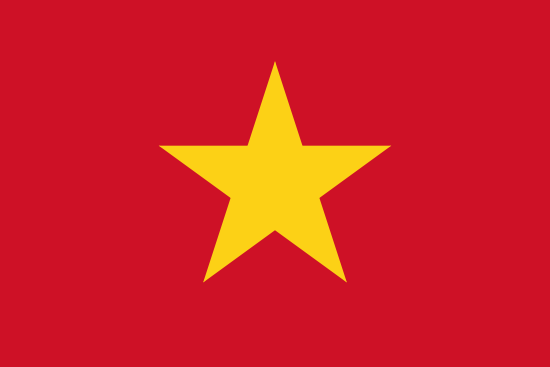 Under Vietnam’s constitution, the people of Vietnam own the country’s natural resources collectively, and these resources are administered by the state. The Mineral Law established two types of licenses: a mineral exploration license and a mineral mining license. Foreign entities are ineligible for mining licenses, but can invest in mining operations through joint venture arrangements that meet certain criteria. Prior to 2010, mining rights were issued under an “ask-give” system, in which an entity would request a license from the relevant state agency, and the state agency would either issue a license or deny the request based on relevant criteria and its own discretion. The 2010 Mineral Law established an auction system for issuing mining licenses. Under the new auction system, entities seeking a mining license submit bids to the Auction Council, and the Council issues a license to the winning bidder (GOV Constitution 1992; GOV Mineral Law 2010a; Mayer Brown JSM 2012). The Ministry of Natural Resources and the Environment (MoNRE) and its corresponding provincial agencies issue licenses, with provincial authorities handling exploration and mining licenses for small-scale operations, common construction materials or peat, and individual mining. MoNRE issues all other licenses in accordance with the Mining Strategy and appropriate master plans. Prospecting requires only written permission from the government (GOV Mineral Law 2010a; Fong-Sam 2012). The licensing system for oil and natural gas is laid out under the Petroleum Law and subsequent regulations (GOV Petroleum Law 1993; GOV Decree 63/2008/ND-CP 2008b; GOV Decree 115/2009/ND-CP 2009b). MoNRE is the lead governmental agency for most matters regarding mineral resources in Vietnam. MoNRE works with the Ministry of Industry and Trade (MOIT) and Vietnam National Coal-Mineral Industries Corporation (Vinacomin), Vietnam’s state-owned coal enterprise, to draft the master plans required under the Mineral Law. These lay out projects and production targets for the large mineral deposits over which MoNRE retains administrative authority. MoNRE’s duties include geological survey work, administration and maintenance of mine licenses and review of environmental impact assessments required under the Law for Environmental Protection. Smaller mineral deposits are not regulated under the master plans and are instead administered by provincial authorities. In addition to assisting MoNRE with master plan drafting for certain mineral commodities, MOIT approves usage and export of minerals (World Bank 2010b). The Ministry of Planning and Investment plays a role in mining administration by registering investment certificates and administering investment capital. Vinacomin owns and operates coal and metal mines on behalf of the state, enters joint ventures with private companies, and directly or indirectly controls 95% of Vietnam’s hard-rock mineral productions (World Bank 2010b). PetroVietnam is Vietnam’s state-owned petroleum enterprise. PetroVietnam, under the authority of MOIT, dominates the oil and natural gas industry in Vietnam. PetroVietnam and its subsidiaries act as operators and regulators of most petroleum based activities, including exploration, production, refining, distribution, importing, exporting and investing in petroleum activities, domestically and abroad. Vietnam does allow private investment in petroleum activities. PetroVietnam controls license issuing, and private operations are generally joint ventures or production sharing contracts in which PetroVietnam has at least 20% equity (GOV Petroleum Law 1993; USEIA 2012). The government has undertaken reforms in recent years to open up mineral and petroleum exploitation to private investment. To this end, it passed amendments to the Petroleum Law in 2008 and a new Mineral Law in 2010. The administration of mineral resources has decentralized somewhat, with provincial agencies receiving licensing and administrative authority over small mineral deposits and deposits of common construction minerals. This devolution of licensing authority has led to an increase in small-scale mining licenses (World Bank2010b). The government has also invested in mining-related infrastructure, both on its own and in conjunction with some of the partners listed in the following section. Projects include a titanium factory in Binh Dinh Province, a natural gas pipeline from the Su Tu Vang oilfield, two new refineries and a plan to mine Vietnam’s largest coal deposit in the Red River Delta Coal Basin (Fong-Sam 2011). Donor organizations do not appear to be funding projects in this sector. However, in partnership with the Vietnamese government, several foreign investors have contributed in recent years to improving the country’s mining industry. In 2009, Atlantic Ltd. of Australia began a partnership with the Vietnam Natural Resources and Environment Corporation (a state-owned corporation under MoNRE) to develop a bauxite mine, a port and a rail system in the central highlands. Other companies, including Sumitomo Metals of Japan, China Steel Corporation of Taiwan and POSCO of South Korea, have invested in projects to expand Vietnam’s iron and steel industry. Formosa Plastic Group of Taiwan has invested in a deep-sea port, an oil refinery, a steel manufacturing unit and a petrochemical complex in Vietnam (Fong-Sam 2011; Atlantic Ltd. 2012).